I’m an 80’s kid and I LIKE today’s technology! My, it seems I’ve been all about unpopular wifi extender reviews. Let’s add one more onto the heap! On Twitter and Facebook, I’ve seen this image floating about. I’ll just put it here in case you haven’t seen it yet. Okay. I get it. You like nostalgia. Who doesn’t? Life just felt more pleasant back then. Saturday morning cartoons, 8-bit Nintendo, mix tapes! Rad stuff! Psst. You can take the rose-tinted nostalgia goggles off now. I won’t deny that there are some very real social problems that either came about or, more likely exacerbated by our new toys. I won’t deny that there should be some no-tech fallbacks for when stuff fails. Those are practical concerns that should not be handwaved because they ruin our fun. But the issue I take with this meme and the underlying sentiment behind it is that the naysayers are discounting how much better our lives have been because we made new stuff and improved on existing things. The argument is that all of this makes people “soft.” It doesn’t. It just makes us aware of how horribly inefficient and tedious the old ways were. Do you really want to go back to when, oh, you had to rewind video tapes or face a fine from the video store because their workers were too lazy (or they just wanted another way to make money)? Or using terribly-outdated encyclopedias when you were tasked with doing research on school projects? Or having your favorite TV shows interrupted by breaking news and not being able to watch said show on demand later? Or having to share a phone line with people who give you grief for wanting to have an extended conversation and it’s not practical to drive across town? Hell, it was like pulling teeth for me to go out with friends at all, because my parents (mostly my mother) used their convenient excuses of “but mah work schedule!” or “but this house is a mess!” to keep us locked away at home all the time and away from friends. And, face it, when friends moved away, you can sing the praises of letters all the time, but “out of sight, out of mind” was very much in effect and the friendship was basically over (I was the one who sent all those letters only to have the replies taper off very quickly). I don’t know about you, but I’ve had more success maintaining long-distance friendships with email/txt/Twitter/Facebook/etc. than with writing letters. But more than that, I feel like this “it was better back then” meme just reeks of trying to shame people for enjoying what we’ve accomplished. “The old days, before we had all these things, were better, and you’re a lesser person for liking these new things!” I guess this is the newest form of “kids these days”-type grousing. Maybe it’s because I’ve had to deal with being shamed for liking things since, well, always, but I’m tired of this “tech is ruining everything” blather. It feeds into my weariness of the pervasive doom and gloom that I have to live with (again, mostly from my mother). I’m also tired of the argument that social media and “selfie culture” makes people narcissistic, because that is a myth and the “narcissism” they speak of is not True Narcissism (aka Narcissistic Personality Disorder), which is far more insidious and dangerous than a somewhat inflated ego by taking pictures of themselves. But that’s something best saved for another post. So, yeah. 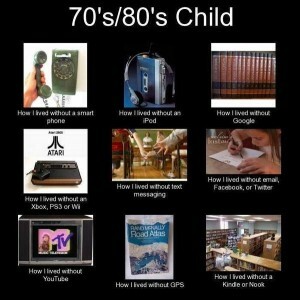 I’m an 80’s kid, and I like today’s technology. I like that I can take pictures of my cat and have them instantly available to post to Twitter (and that I can take pictures of seemingly trivial stuff like my cat’s weird sleeping poses without having to worry about wasting film). I like that, if I miss the first broadcast of a TV show or movie, it’s more and more likely I’ll be able to stream (or otherwise obtain, ahem) it somewhere after the fact rather than have to wait on a possible re-airing. I like that if I want to research something, I have a pretty good assurance that the reputable sources are not horrendously out of date. I like that if I want to play a video game with someone, I don’t have to physically be in the same room if they’re on the other side of the country (or planet). If I want to talk to them and text chat is too slow (or not available, ‘sup Nintendo)? Good thing we have things like Skype and Ventrilo! I like that if I want to reference a funny scene from something, I can call it up on YouTube rather than stumble over my own words to describe it and probably misremember some things (plus I don’t have to be at the mercy of what Big Media decides I should like, because I have weird tastes). I like social media. I may not be hugely popular, but at least I don’t feel so alone, as I would otherwise be because my circumstances don’t let me, you know, go out and have local friends anymore. Yes, change is scary. It’s tempting to want to go back. But we can’t go back, it’s just not practical. And the awesome thing about being human is our love of tweaking, improving and making new things. We should not be ashamed (or shame others) of what we have accomplished. If there are problems resulting from, made worse with or being revisited through our creations, let’s put our energy into fixing them rather than calling for firebombing everything and retreating into the past, where things were most definitely NOT better.